This article covers Basic Anatomy, The Back Exercises, some Good Articles and worthwhile Videos. Page two covers the Key Rules of Back Training and Sample Workouts. There are several key back muscles to train in the gym, so we’ll start at the top. 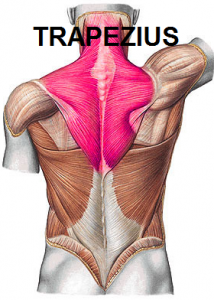 The Trapezius “Traps” muscles are the large triangular muscles in the upper back, between the shoulders. You can break them down into Upper, Middle and Lower Trapezius. Its function is to move the shoulder blades (Scapulae) when the spine is stable, or move the spine when the shoulder blades are stable. A “shrugging” motion will use the Upper Traps, while a “rowing” action is more likely to hit the Middle and Lower Traps. The Rear Deltoid “Delts” is actually a shoulder muscle, but is activated a lot in back exercises like Face Pulls, which you’ll see later. The Rhomboids are found underneath the Traps and these are used to pull the shoulders back or squeeze them together. These would also benefit from a “rowing” action. 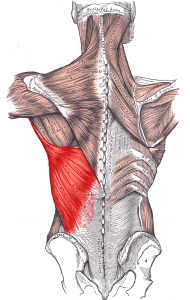 The Latissimus Dorsi “Lats” are the large muscles that help form the ‘V’ shape of a well-developed back. They are responsible for extension and adduction of the shoulder joint, and tend to engage other muscles to support the movements. You can train them with vertical pulling (e.g. pull-ups), horizontal pulling (e.g. bent-over row), as well as the deadlift. 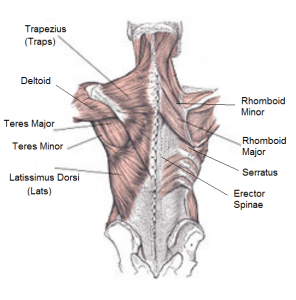 The Teres Major/Minor is underneath the larger Lat muscles, and since it’s recruited for some of the main movements you will not need to target it specifically in your program. The Erector Spinae are muscles involved in flexion and extension of the spine. These are important for a strong posture and stable core. They get used in compound lifts like the Squat and Deadlift, as well as movements like Hyper-extensions. 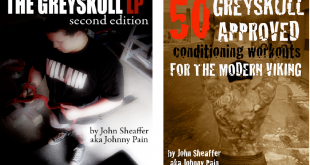 The following are links to Articles on Back Training that could be of interest. The main points of each article are below in Bullet Points. 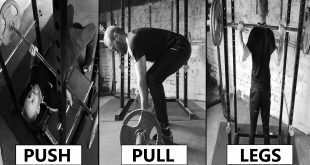 Deadlifts – do them first so you are fresh! BB Bent Over Row – another big movement to do early in the workout if going heavy. If your grip is weak it will limit weight and therefore back development – use straps for maximal stimulation. Make sure form is strict. 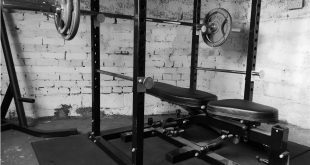 Too many lifters use momentum when training back. Back routine should be 3-4 exercises, not including Rear Delt or Upper Trap work.